I love learning new life hacks, those clever little tricks and tips that help us to get more done in less time. When it comes to cleaning I'm all for getting quick results with the minimum effort and the hacks in this guest post certainly fit into that category. By the way, my cleaning hack is to use bicarbonate of soda to get rid of smells - sprinkle liberally on to the smelly surface, leave for a couple of hours then wipe or hoover up. Works every time. There is definitely more to life than cleaning. But every now and again, nothing beats some serious scrubbing and dusting to clear the mind as well as the house. At the risk of sounding cheesy, it’s good for the soul. Here’s 5 cleaning hacks that will, in a small but significant way, change your life. If you’re like most of us, that cupboard under your sink where you keep all your cleaning products is likely to be a bit of a mess. Get organised by sticking an old curtain pole across the cupboard to hang all your cleaning sprays on, and two or three plastic baskets to keep everything else organised and tidy. Voila – a cupboard you will be excited to open! If your dishes aren't coming out sparkling, it's time to give the dishwasher a serious spring clean – all you need is some distilled white vinegar, baking soda, paper towels and an old toothbrush. First take out all the removable parts and wash them in vinegar and water, using a paste of baking soda and water on the really tough stains. 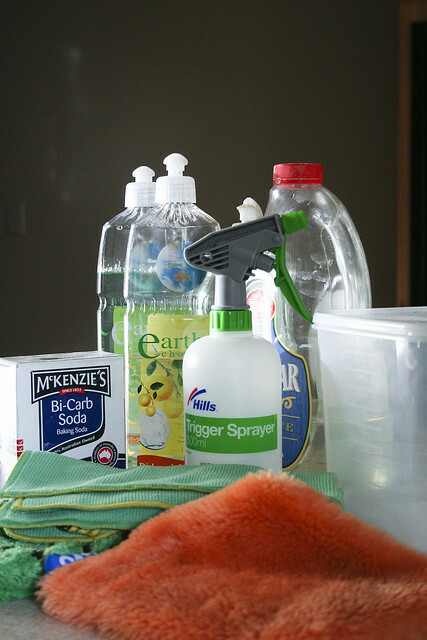 Once done, pop a cycle on with some vinegar instead of washer tablets, and wipe dry with paper towels. For an ultra-clean, stop the cycle mid-way through to let the vinegar sink to the bottom. Don’t forget to wipe down the outside too, for a shimmering finish. If your dishwasher is truly on the fritz though, retailers like Tesco offer various dishwashers at a reasonable prices. Whether it’s a full-bottle or just a smudge, we have all had accidents with nail polish that appear to be irreparable. But never fear – where there’s a spill there’s a way! First, pour nail varnish remover liberally onto the stain and leave for a few minutes. Mop up with paper towels. Next scrub with a ‘magic eraser’ (available in good hardware stores). And if it is really stubborn, reach for the hairspray. A quick spray and wipe, and the stain will be no more! You sit down after a hard day to watch a bit of telly... only to discover smears all across your lovely plasma screen TV. Not to worry – grab a can of WD4- and pop a couple of sprays onto a microfiber cloth. Gently wipe the offending area in small circles, trying not to apply too much pressure. This hack will also work on laptops. Lampshades are one place that gets seriously dusty. The simplest way to remove dust from them is not to sit for hours with a feather duster, but instead use a lint clothes roller. A few rolls and you’re done (and they might just let the light through again, too). Try one or two of these cheap and easy tips next time you feel the urge to reach for the rubber gloves. Chances are they will become habits for life. Images by go_greener_oz used under the Creative Commons license.